Place chicken and buttermilk in a shallow pan and toss to coat; lay pieces flat side-by-side. Cover with plastic wrap and refrigerate while preparing other ingredients, or chicken can be chilled as long as overnight. Preheat oven to 400 degrees. Spread the olive oil evenly in a jelly roll pan or shallow roasting pan; set aside. Place cumin seeds in a small heavy skillet over medium heat. Toast seeds, shaking pan frequently, until they become fragrant and lightly browned, about 2-1/2 minutes. Place seeds in a food processor or blender along with the Grape Nuts, paprika, salt, and pepper. Process until cereal forms fine crumbs. Transfer mixture to a shallow plate or pie plate. Remove chicken pieces from buttermilk one at a time and coat each piece all over in cereal mixture, shaking off excess. Place chicken side-by-side in prepared pan; discard buttermilk. 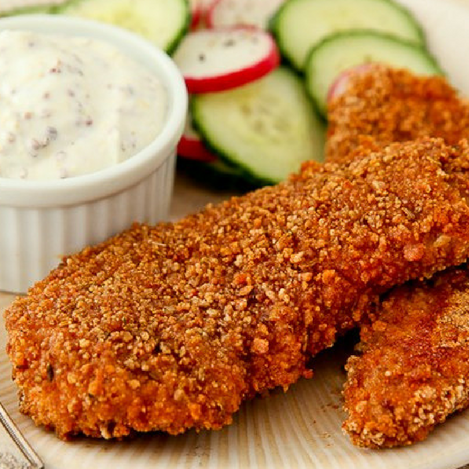 Bake chicken for 4-6 minutes per side for tenders, or 10 – 12 minutes for breasts, depending on the thickness, until they are crispy and cooked through. Serve with yogurt dipping sauce: stir together all dip ingredients until blended. Serves 4-6. The tenders are also excellent served with prepared hummus as a dip. Serve with a marinated salad of cucumbers and radishes for a beautiful presentation.